Busy day on the blog today! For the 25 Days of Christmas Tags – Concord & 9th and giveaway please scroll down or click here. 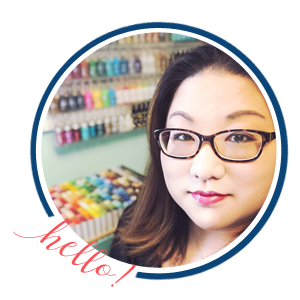 It’s a big hop so I’ll only share two cards today but make sure to stop by next week when I share everything else I’ve made with products from the December card kit, the Limited Edition Holiday card kit, and the Advent Plus release! The December card kit has sold out but I’ll link to most of the individual supplies below…also, just a heads up that the Limited Edition Holiday card kit is almost sold out so don’t delay if you want to purchase it! You should have arrived from Yana’s blog and Wanda is your next stop. There’s a full hop list at the bottom of my post in case you get lost along with giveaway details! My first card uses the December card kit! That reindeer is so stinkin’ cute! I absolutely adore him! I started by stamping my gift boxes and Christmas tree onto white cardstock with copic-friendly ink. I used post-it notes to mask the boxes so that I could layer them. 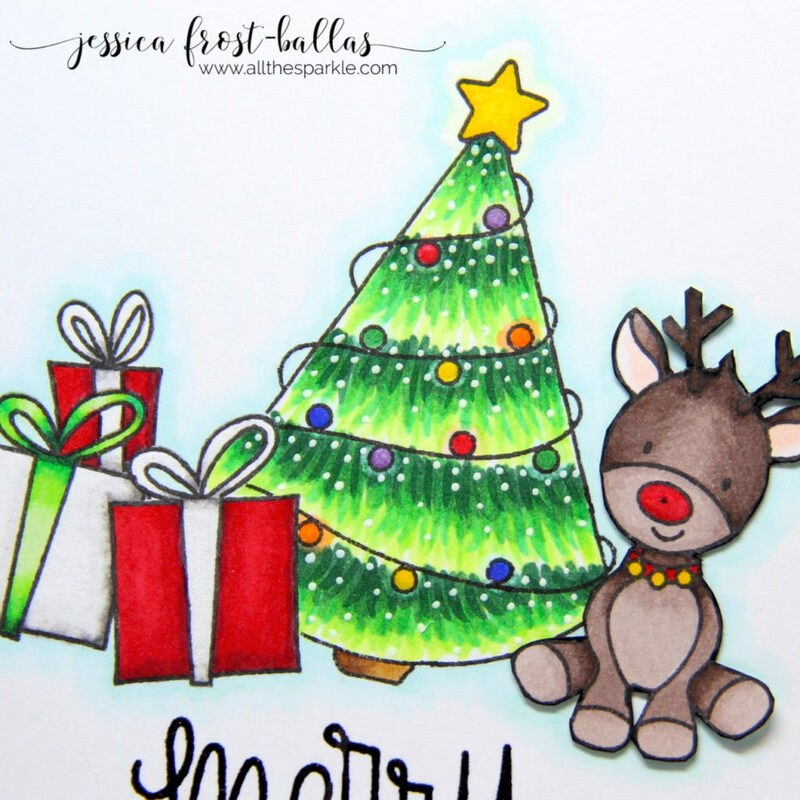 I stamped my reindeer on a scrap piece of white cardstock with the same ink and then colored all of my images with copic markers. I added spectrum noir clear sparkle to the ornaments on the tree, the reindeer’s collar, and the gift boxes. I also added white dot detail to the tree with a signo gel pen. I stamped the sentiment onto the card with versafine and heat-embossed it with clear embossing powder. Next I fussy cut my reindeer and punched a tiny hole in the middle of his nose. I adhered him to my scene with foam mounting tape and carefully punched the hole all the way through the background cardstock. Then I used the Chibitronics kit to create a circuit to light up Rudolph’s nose! I love that you can color the LED lights with copic markers to create colored lights. I added a strip of paper between the battery and copper tape to break the circuit and conserve the battery for mailing. When the recipient removes the strip his nose will light up! 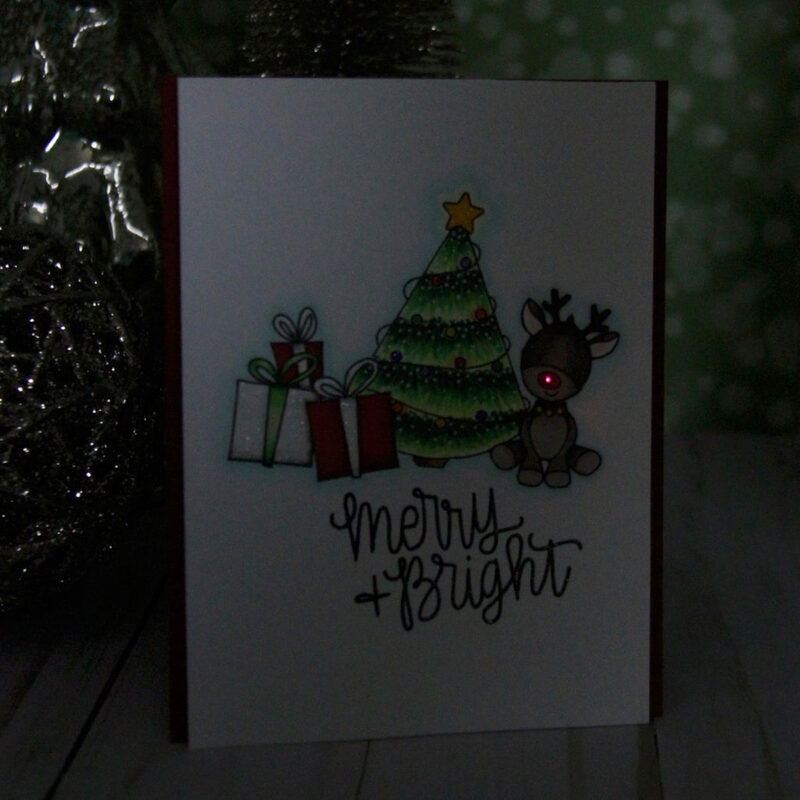 In general I love interactive cards and these lights definitely add a fun element to a handmade card! 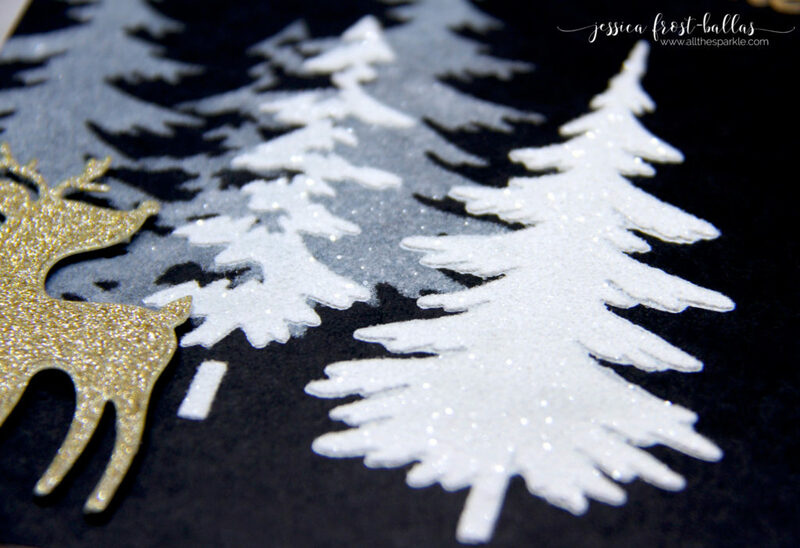 Next I used products from the Limited Edition Holiday card kit to create an elegant monochromatic card with touches of gold! 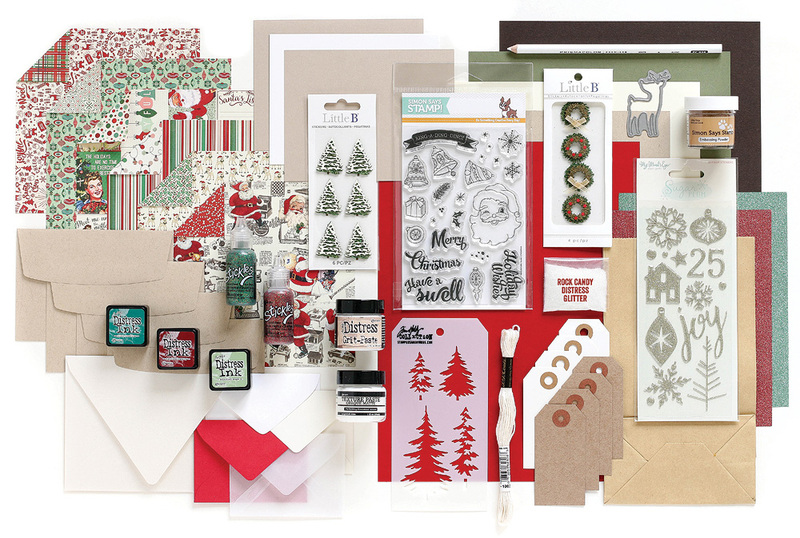 This kit is jam-packed with all kinds of awesome card-making goodies! I think my favorites are that darling deer die, the patterned papers, the envelopes, and the stencil! For my card I started by laying my stencil on a piece of black cardstock. 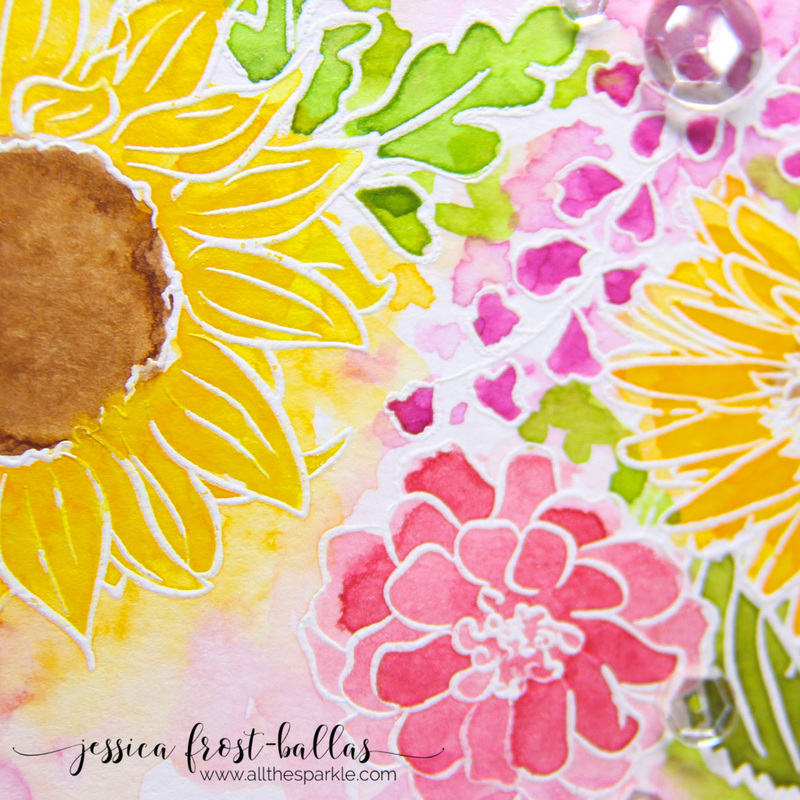 I used a dauber tool to apply white pigment ink over my stencil. Then I applied the grit paste from the kit over the trees and sprinkled the paste and wet pigment ink with rock candy distress glitter. I love how the mix of pigment ink and paste gives the appearance of dimension. I let that dry while I die-cut the deer from gold glitter paper. Once the paste was dried I stamped the sentiment with versamark and heat-embossed it with Antique Gold embossing powder. Finally I adhered the deer with foam mounting tape. I love the mix of textures and dimension on this card. Simon Says Stamp really knocked it out of the park with this kit! Thanks for visiting and have a wonderful day! If this is your first time visiting my blog I hope you’ll come back! ? Happy Hopping! Hi Jessica – oh my oh my – loving your art work here! Love the deer scene very very much! TFS your beautiful work and for the hop – have a blessed week! Both of your creations are soooooo adorable, love what you did with this amazing kit! I really like the card with dark background and trees! Very dramatic! Wow! Fun and gorgeous are my words to describe your two cards. Love your trees! Thank you for sharing. I completely agree the reindeer is stinkin cute!! And your card is too! Love them both! Thank you for sharing! What beautiful holiday cards! I agree with you — the reindeer is just adorable! But I really like the dark background with trees in the second card — it is very elegant! 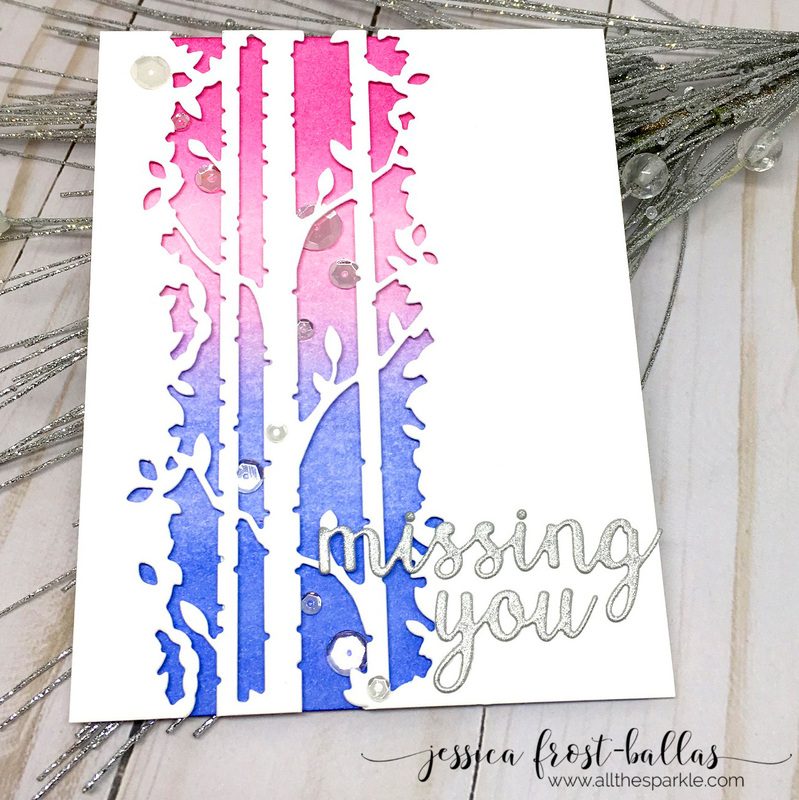 Love the coloring of the tree on your first card! Adore that gold deer on the dark card – so stunning! Great cards….I really love your coloring and that light on his nose is just awesome! Thanks for the inspiration! Beautiful card! This will be perfect for my holiday cards! Joy, Peace and Love to you this Holiday Season! Beautiful, I can’t wait to get my kit. I love your cards. The trees are gorgeous and that reindeer is adorable! Love your different cards. Very inspiring! I love both of these cards! The first one made me smile and the second one is so pretty! Thanks for the inspiration! Wow! Your first card is precious! I love the sentiment and the way you colored the tree. And the sparkly trees are gorgeous! Wow! Love your cards. The snowy trees on the dark background is gorgeous! So elegant! 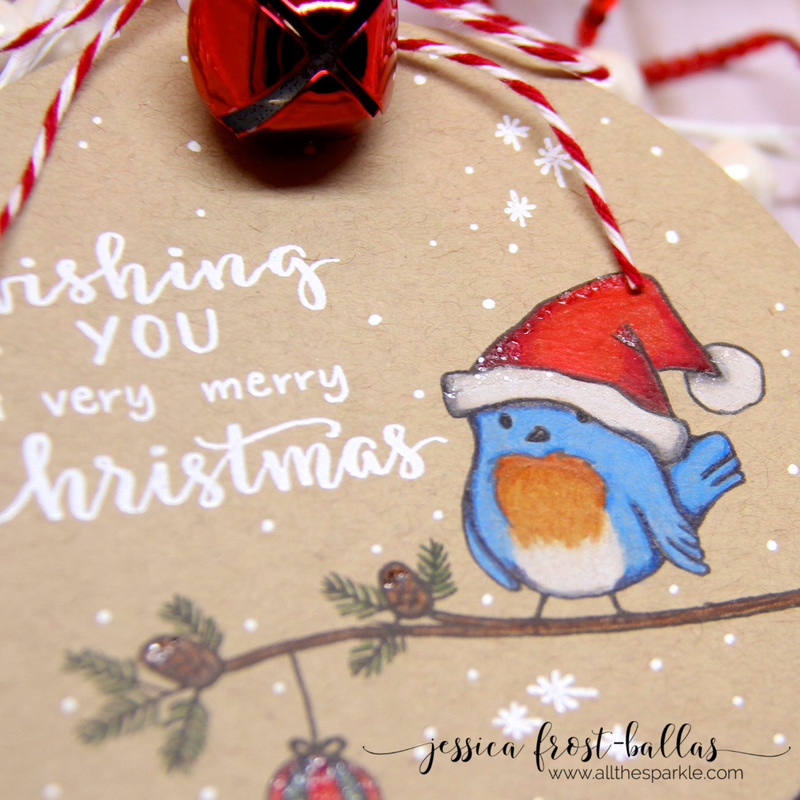 Beautiful cards, lovely designs! Fabulous coloring on your first one and I just adore the black and white, gold and silver on your second one! Awesome!